Rob McAninch Photography specializes in location portraits in the Pittsburgh, PA area. With a blend of classic portrait techniques, contemporary fashion, photojournalism, and artistic style to photograph the special portrait moments in your life. Wedding portraits, Senior portraits, and Children are among Rob McAninch Photography's full featured portrait packages. Also available for event photography and head shots. Rob McAninch is a portrait artist. Rob grew up working with pencil, ink, colored pencils, and charcoals; and had an occasional encounter with paints. Mostly Rob McAninch leaned toward realism in his renditions of nature, cars, and the occasional person. Rob's interest for photography began as a teenager when he picked up a 35mm point and shoot camera. "Portraits are as real as a two dimensional art form gets." Landscapes and wildlife pictures fit naturally with his hiking and bicycling activities. Candid and casual portrait poses increased his interest in people pictures. 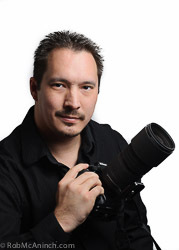 In 2005 Rob McAninch took his photography talents to a new level in opening a portrait business. While he works in Information Technology and spent a number of years in customer service fields; photography is a passion. As a PPA and NAPP member Rob is continuously striving to improve his portrait skills and craft. Rob has attended seminars and workshops with such industry leaders as David Ziser, Sal Cincotta, Clay Blackmore, Ed Pierce, David 'the Strobist' Hobby, and Joe McNally. Based near Pittsburgh, PA; Butler, Kittanning, New Bethlehem, Indiana, Clarion, and surrounding areas. Special events and location weddings in the U.S. are available by request.